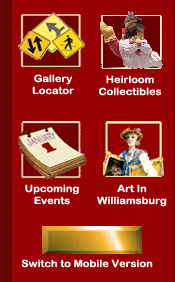 One exhibition room at The Art-cade Gallery is named for Matthew Pratt, who as an early colonial artist recorded a first for the “arts” here in the New World. 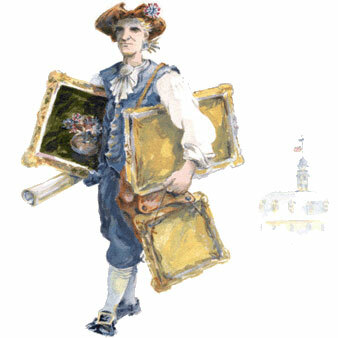 America’s first recorded art exhibition was organized by itinerant colonial artist Matthew Pratt (1734-1805) here in Williamsburg, Virginia. 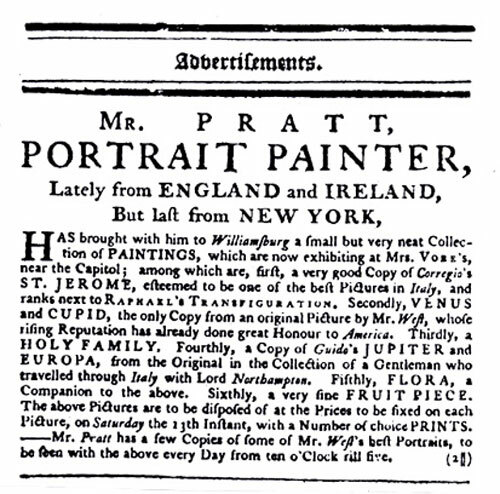 In the March 4, 1773 issue of the “Virginia Gazette” newspaper, Philadelphia native Pratt advertised an exhibition and sale of artwork including copied works of Old Masters, to be displayed at “Mrs. Vobe’s” (King’s Arms Tavern). See the copy of his advertisement below. For the next two weeks Mr. Pratt again advertised his artwork and talent in the “Gazette.” But by week two the wording of his message changed from “to be disposed of at the Prices to be fixed on each Picture” to announcing that the artwork will be disposed of “by Way of Auction, to the highest Bidder.” He also mentions in his ad that he will be leaving the city the next week. His final “Gazette” advertisement offers his services to “any Gentlemen or Ladies [who] are desirous to employ” him and asks them to leave a message for him at the local post office. He planned to spend the summer back in New York. Mr. Pratt served an art apprenticeship under his artist-uncle James Claypoole in Philadelphia in the early 1750s. He then successfully ventured out on his own becoming recognized in the colonies as a successful portrait painter. In 1764 he escorted his cousin to London for her marriage to famous British artist Benjamin West. For two and a half years Pratt remained in England as the first of West’s many American students. After the Revolution, Mr. Pratt was more successful as a creator of unusual signs than for his portraits in the newly created country. He died in Philadelphia in 1805.